For many of us, clean, drinkable water comes right out of the tap. But for billions it’s not that simple, and all over the world researchers are looking into ways to fix that. 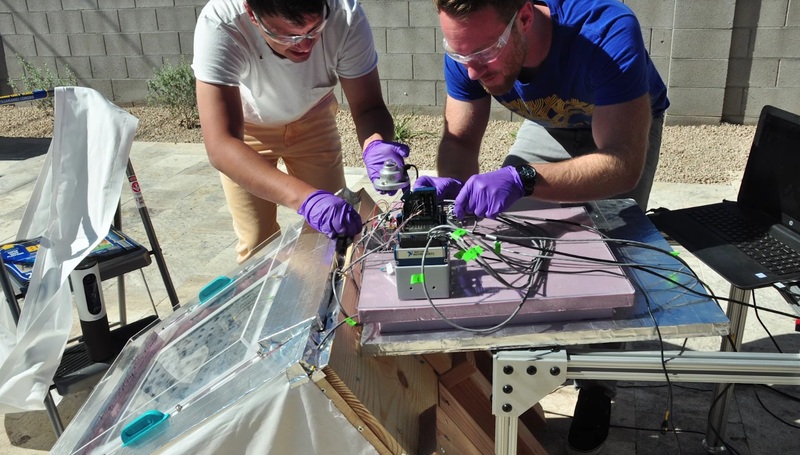 Today brings work from Berkeley, where a team is working on a water-harvesting apparatus that requires no power and can produce water even in the dry air of the desert. Hey, if a cactus can do it, why can’t we? While there are numerous methods for collecting water from the air, many require power or parts that need to be replaced; what professor Omar Yaghi has developed needs neither. The secret isn’t some clever solar concentrator or low-friction fan — it’s all about the materials. Yaghi is a chemist, and has created what’s called a metal-organic framework, or MOF, that’s eager both to absorb and release water. It’s essentially a powder made of tiny crystals in which water molecules get caught as the temperature decreases. Then, when the temperature increases again, the water is released into the air again. Yaghi demonstrated the process on a small scale last year, but now he and his team have published the results of a larger field test producing real-world amounts of water. They put together a box about two feet per side with a layer of MOF on top that sits exposed to the air. Every night the temperature drops and the humidity rises, and water is trapped inside the MOF; in the morning, the sun’s heat drives the water from the powder, and it condenses on the box’s sides, kept cool by a sort of hat. The result of a night’s work: 3 ounces of water per pound of MOF used. That’s not much more than a few sips, but improvements are already on the way. Currently the MOF uses zicronium, but an aluminum-based MOF, already being tested in the lab, will cost 99 percent less and produce twice as much water. With the new powder and a handful of boxes, a person’s drinking needs are met without using any power or consumable material. Add a mechanism that harvests and stores the water and you’ve got yourself an off-grid potable water solution. He says there are already commercial products in development. More tests, with mechanical improvements and including the new MOF, are planned for the hottest months of the summer.